This is such a great eggplant dish, I wanted to update the photos from the original post. The following text is in its original form, but the photos have been replaced. For my week of French food, I chose one meal from Ina’s Barefoot in Paris . This is easy French food, as the subtitle rightly claims. 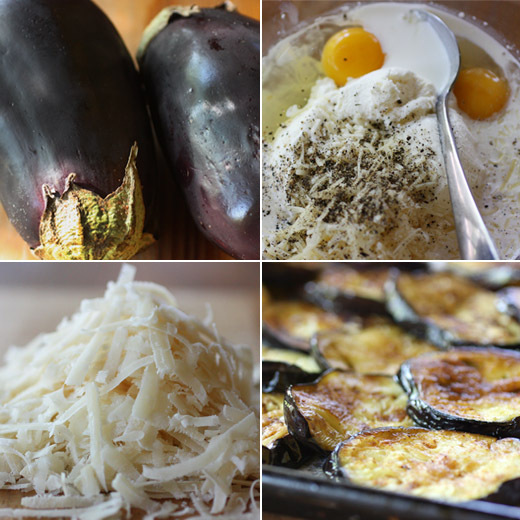 Eggplant gratin was Ina’s husband’s favorite meal the first time they visited Paris. I can see why. 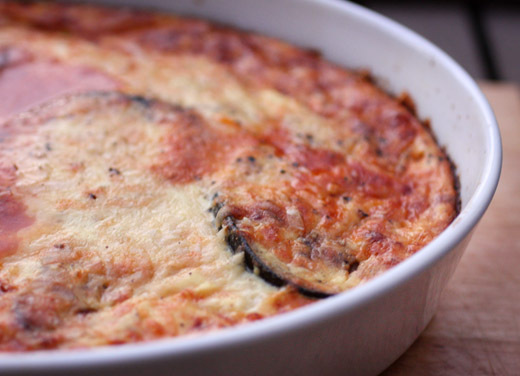 I had an eggplant from my CSA, and in this richly flavored gratin, it made quite a meal. I also served Ina’s green salad vinaigrette and some toasted sourdough baguette with the gratin. The only problem with this meal was that it ended up happening one day later than planned. While prepping the parts of the gratin, I pre-heated my oven or thought I did. Just when I was ready to pop the dish into it, I noticed that it had pre-heated to nothing. This is the same oven that had just baked baguettes the day before, and it sat there, literally giving me the cold shoulder, mocking my dinner-making efforts. Into the refrigerator went the gratin. A pasta meal was prepared instead, and the next morning I set about finding an oven repair person. Unbelievably, I found a repair service that came an hour and a half after being called, fixed the oven quickly, and charged exactly what was quoted. I had forgotten what it’s like to receive such good service. With the oven back in working order, the gratin was baked at last. It’s really a simple dish. You do have to fry the eggplant slices before layering them into the dish, but that’s the most difficult part of the preparation. The recipe suggests using a store-bought tomato sauce, but I had some left-over, homemade sauce in my freezer. That was thawed and poured over the fried eggplant slices in a baking dish, a second layer of eggplant was added, and a mixture of ricotta, eggs, half and half, and parmigiano reggiano was spread on top. These were supposed to have been individual gratins in separate dishes, but I used one larger baking dish instead. A little extra parmigiano was applied, and it was placed in the once again fully functioning oven. This is similar to eggplant parmesan, but the ricotta mixture puffed into a nice, custard-like layer making it a slightly different dish. I could see making a larger version of this with several other vegetables included as well, but it was an excellent way to highlight eggplant. The tomato sauce and the cheese mixture were delicious together, and the humble eggplant was made into something really special. With the salad and bread, it was a great meal. I can also highly recommend the green salad vinaigrette made with an egg yolk. Because of my oven issue, I learned that the gratin can be made in advance and baked when you’re ready. Good to know. This was another successful meal from Ina, and clearly Jeffrey has very good taste. Happy to hear that your oven is back in working order and that good customer service actually still exists somewhere! This gratin is downright excellent (and it's great that you discovered it can be prepped ahead); The last photo of it, the slice of baguette and fresh salad is just about the perfect light meal. I would have drivin' myself nuts if my oven broke down. Looks delicious. It just so happens that I got a nice plump eggplant from the farmers market today. ;-) Plus I love Ina's recipes. I love Ina's recipes. They never let me down. My oven wasn't working for awhile. I could barely function. My pupils literally dilate when I see eggplants. I just love them so much. And a gratin is probably the best way to have them. Thanks for this great recipe, I'm glad the oven cooperated! I'm kind of ambivalent about eggplant but if you are making it - especially with an Ina reciep - I'll eat it! Glad to hear your oven is back in working order. Wish I could get service like that! wow, that looks great. i love eggplants but i've never had eggplant parmesan. i am definitely going to have to try this! We all love eggplants & I try make different things everytime i make eggplant. Thanks for sharing this. Lisa your oven sounds like mine & mine is still not fixed. (our fault..didn't take any initiative) ..was it the element (the heating thing) that needed to be replaced? Soma: my oven problem was the ignitor, and thankfully it was an easy fix. perfect - I love eggplant and this method is perfect for a 'per serving' set up....looks great! Love your dish, looks so tasty and healthy. That's a great week that you are having. Not a fan of eggplant but I believe I have come across all, that are not properly prepared. Yours look perfect. MMMMM,...a lovely aubergine gratin!! I make something similar! I love aubergines!! What a lovely summer dish!! Oooh these look sooooo good! Love eggplant, now is perfect time to create so many interesting recipe like yours. Look scrumptious Lisa! I've been following your blog and thought you would be interested in our supper club event on August 4th. 5 courses with wine and drink pairings and it's taking place at the beautiful Allan House mansion downtown. For more information and the menu visit www.royalfig.com/supper-club. Hope to see you there! Thanks for the interesting blog posts! Keep 'em comin! eggplant is a regular in my house but not this way.. this is a most welcome change of pace for them. Oh no! That is terrible about your oven, but I bet the gratin tasted even better a day later! eggplant is my favorite summer dish! this looks delicious! This sounds absolutely delicious with the ricotta in it! A nice change from regular eggplant parmesan. Yummy!! I love cheesy eggplants! I've never tried it with ricotta, sounds like a nice twist! I am drooling over this picture -- love love love your blog :) I hope to make this sometime soon but I doubt it will look as good as this one! Looks delicious and I am sure that homemade sauce made a big difference. Finally planted eggplant this year, so this will be the perfect dish once they get bigger. That puffy ricotta mixture sounds great! Home made sauce, even thawed, usually beats the jarred stuff hands down. Glad the oven fix went so quickly! Hahaha Jeffrey definitely has good taste and he is also a very lucky man to have Ina cooking for him every night! The dish looks fantastic! I love eggplant in so many ways and forms. Good to know you can prep this dish ahead of time, too. Makes it easier when you have company. Outside of my health food store cafe I have a hard time convincing people to try eggplant in recipes, or in their daily diets, but I might present this dish to them...yummy! I used to not be the biggest eggplant fan, now I absolutely love it! These slices look soo good! Instead of frying for things like this (and parm) I've taken to baking the slices with a little olive oil until they're soft and browned. It's healthier and less messy. And not as good as this. Besides figs, eggplant is my number 1!!!! Loving anything with the word "gratin". I love eggplant or aubergine in all its forms and this one sounds stunningly good. Eggplants are filling, delicious and easy to prep, which is great for summer. Ina rarely disappoints. 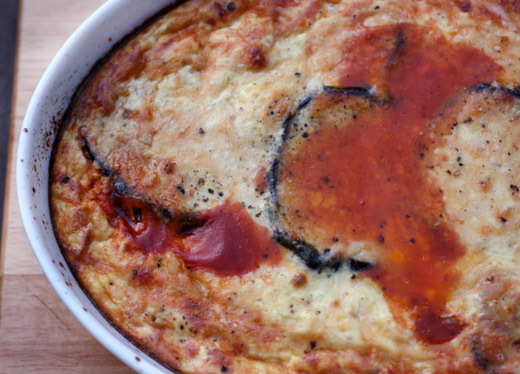 I love eggplant, too, and this sounds incredible - sort of lasagna-like, too, with the ricotta. You just can't have too much ricotta!